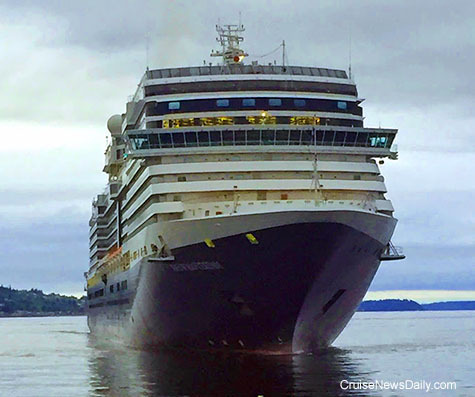 Holland America’s Nieuw Amsterdam arrived in Seattle early this morning to kick off the start of the summer Alaska cruise season, and it’s anticipated that this will be a record season for both Holland America and for the Port of Seattle. Nieuw Amsterdam is one of three Holland America ships that will be homeported at Seattle this summer and one of the fleet of 11 of seven brands that will be sailing from Seattle this year. Details appeared in the April 29 edition of Cruise News Daily. As you know, Carnival’s new Fathom social impact brand will begin cruising from Miami to Cuba on Sunday. It will be the first time in 50 years the average American can cruise to Cuba. Under US law it’s still not possible to legally take a conventional cruise to Cuba where the point is just dining well, being entertained, going to the beach and doing some shopping and sightseeing. US law says if you aren’t in some special category like vising your Cuban relatives or a journalist on assignment, you have to be on some kind of educational or humanitarian mission - and learning something about the country and its culture qualifies as “educational.” So for the moment, if you want to cruise to Cuba, Fathom is your ticket. Other lines have expressed their desire to cruise there, but for their type of cruise, they know they are going to have to wait until US law changes. Royal Caribbean executives talked about their interest in eventually cruising to Cuban ports during their conference call this morning to discuss their quarterly earnings. But after the call, they revealed they have some other plans in process. The complete article appeared in the April 29 edition of Cruise News Daily. 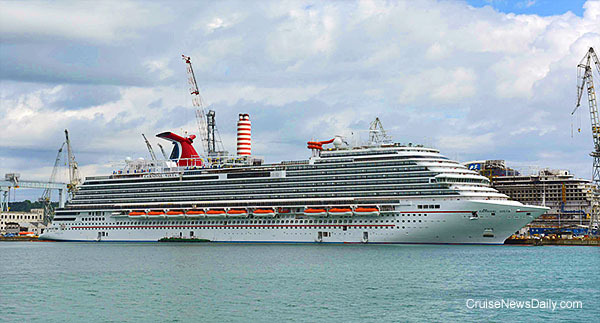 Carnival Cruise Line’s fleet grew a little today - by one ship - but its capacity grew by a lot - 3,954 passengers - when the line took delivery of the 133,500-ton Carnival Vista from Fincantieri. The ship will enter service on May 1 in the Mediterranean and remain there through October when it repositions to North America. The complete story appears in the April 28 edition of Cruise News Daily. The complete stories appeared in the April 28 edition of Cruise News Daily. 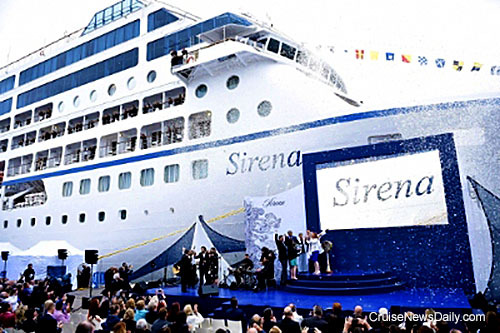 Godmother Claudine Pepin christened Oceania’s newest ship to join the fleet, Sirena, with a bottle of Moet & Chandon's finest champagne. The event took place at the Port of Barcelona this evening. Claudine Pepin is the daughter of Master Chef Jacques Pepin, who is Oceania’s Executive Culinary Director. Photo courtesy of Oceania Cruises. All rights reserved. May not be copied or used without express permission. When ships rescue people clinging to a boat in the Florida Straits off the Coast of Cuba, they are usually trying to leave Cuba. Last Thursday, Disney Fantasy rescued three men clinging to the side of a capsized boat, but once they handed them over to the US Coast Guard, it was discovered they were probably trying to go TO Cuba. In the movie “Home Alone” the parents went off on vacation and accidentally left the kid home alone. In this story, the kids sail away on the cruise and leave the parents on shore. It happened - kind of - last week when Norwegian Breakaway was sailing from Nassau back to New York. Dining has always been a memorable experience aboard Queen Mary 2. With the upcoming “remastering” of the ship, Cunard intends to make the dining experience aboard their flagship even more memorable with new restaurants and menus. With the June date for the liner’s trip to the yard soon approaching, the finishing touches are being put on the plans - and on the new menus which will debut with the remastered Queen Mary 2. The videos below will give you a look at how the new menus were created and a quick look at the new spaces where you will be dining on these creations. The complete story appeared in the April 26 edition of Cruise News Daily. Rhapsody of the Seas encountered inclement weather very early Monday morning as it was sailing from Barcelona to Corsica. The storm broke five stateroom windows on the third deck allowing a lot of water in. There were no serious injuries. Six staterooms were damaged, and carpeting in nearby hallways and staterooms was soaked. Details appeared in the April 26 edition of Cruise News Daily. The Cake Boss exiting Norwegian Cruise Lines, but they won't be cakeless. Genting Hong Kong completing acquisition of three more German shipyards with impressive assents to help the company build ships for their three brands: Crystal Cruises, Dream Cruises and Star Cruises. The complete stories appeared in the April 26 edition of Cruise News Daily. Meyer Turku laid the keel today for Mein Schiff 6. While it may look like Mein Schiff 5, there are significant differences “under the hood.” This is the fourth ship constructed by Meyer Turku for the line, which is a partnership between TUI Travel and Royal Caribbean. The block put into place today is the first of 77 that will comprise the ship. Meyer Turku CEO Jan Meyer noted in his remarks that it will now take only seven months for the construction work to be completed, and then the yard can move to the outfitting and testing of the systems. What Caribbean ports are you least likely to leave alive? Princess finds a perfect fit at Cairns. 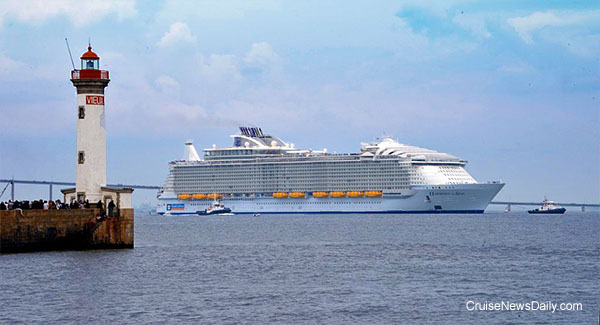 Harmony of the Seas goes out again for sea trials. Photo courtesy of Royal Caribbean. All rights reserved. May not be copied or used without express permission. SEATTLE, WA – April 25, 2016 – Leading small ship cruise line Windstar Cruises has added six new individuals to its corporate operations, including a new vice president of deployment and revenue operations, vice president of accounting, director of public relations and social media, director of information technology, controller, and risk manager. The luxury cruise line doubled its fleet in the last two years adding three all-suite power yachts to complement three mega-sailing yachts. The small ship leader carries between 150 and 300 guests on the various ships deployed to international destinations. The company’s corporate offices are experiencing corresponding growth adding new executive and staff positions to support sales, marketing, finance, and operations and are expanding its downtown Seattle headquarters, which now employs approximately 120 travel professionals in the Pacific Northwest region and approximately 700 fleet employees worldwide. Doug Santoni has been named the new vice president of deployment and revenue operations at Windstar. Santoni is an experienced executive in the travel and transportation industry, with expertise in pricing, strategy, and advanced analytics. Santoni previously held executive roles with Royal Caribbean Cruises LTD, where he led revenue management and pricing for the multi-branded global fleet of cruise ships and was charged with deploying vessels to maximize profitability and support key brand positions. Immediately prior to joining Windstar, Santoni was the pricing executive for Boeing Commercial Airplanes’ Group in Seattle. He holds a bachelor’s degree in operations research and a Master of Engineering and Master of Business Administration from Cornell University. As vice president of deployment and revenue operations at Windstar Cruises, Santoni leads a variety of key commercial functions encompassing revenue management, deployment and itinerary planning, product development, and vacation planning via the customer contact center. Peter Beck comes to Windstar as the new vice president of accounting. Beck brings 25 years of financial, accounting, and staff management experience, most recently working at Seattle-based Columbia Hospitality, Inc. as vice president and chief financial officer. Previous positions included serving as vice president and chief financial officer for the Space Needle Corporation, as well as several progressive positions within the finance department of Westin Hotels & Resorts. Beck is a certified public accountant and holds a bachelor’s degree in business administration from California State University, Fullerton. As vice president of accounting at Windstar, Beck is responsible for overseeing management of the company’s financial reporting and accounting functions. Additional responsibilities include managing the budgeting, forecasting, capital planning, and risk management process. Mary Schimmelman joins Windstar Cruises as director of public relations and social media, bringing a passion for cruise travel and a comprehensive background in communications and travel. Most recently Mary served as senior manager of social media marketing for Holland America Line, where she was responsible for establishing and growing the brand’s overall social media program including content development, multi-channel publishing, partnerships, and integrated marketing communications. Prior to that, Schimmelman was a member of Holland America’s public relations team. She holds a bachelor’s degree in humanities and communications from Seattle University. As director of public relations and social media at Windstar, Schimmelman is responsible for all aspects of public relations including brand positioning, media relations, corporate communications, special events, issues management, as well as social media oversight including content curation and publishing, marketing integration, community engagement via Windstar’s vast portfolio of social outlets. Brian Kimmons serves as the new director of information technology for Windstar Cruises and brings 20 years of hospitality information technology experience, including 15 in the cruise industry. Previous positions include working as director of information technology for Four Seasons Hotels & Resorts, as well as ten years at Silversea Cruise Lines. Kimmons holds a degree in computer science and biochemistry from the University of North Carolina at Chapel Hill. At Windstar, Kimmons is focused on implementing new corporate information technology standards, as well as providing around the clock support to Windstar’s vessels in Europe, French Polynesia, and the Caribbean. Gina Smith arrives at Windstar with more than 20 years of experience, bringing an extensive background in accounting and financial systems most recently working as controller at the Bellevue Club in Bellevue, Washington. She holds a bachelor’s degree in accounting from Seattle University. As Windstar controller, Smith is responsible for providing financial information to the organization, both in reporting company-wide operational results and managing department budgets and financial forecasts. Jay Juang embarks Windstar as risk manager, coming to the company with more than 20 years of risk management roles, most recently as vice president and claims manager at Mitsui Sumitomo Marine Insurance. Juang began his maritime career sailing on container ships, passenger vessels, and supertankers, eventually being promoted to captain. He holds a bachelor’s degree in marine transportation from New York Maritime College and a Master of Business Administration in insurance from St. Johns University. Juang focuses on managing the Windstar fleet’s operational risks to provide the best customer experience possible. LOS ANGELES, April 25, 2016 – As it continues the most significant brand portfolio expansion in luxury travel and hospitality history, Crystal Cruises is also expanding its executive bench power. The line today announced the appointment of longtime luxury cruise industry executive Christian Sauleau as its new senior vice president of operations and total guest satisfaction, and will report directly to Thomas Mazloum, Crystal’s chief operating officer. In this newly created position, Sauleau will oversee Crystal’s departments of marine, hotel, food & beverage, entertainment and land programs. He will also manage safety and security operations, as well as officer and crew hiring processes and development, with the goal of maintaining the line’s long-celebrated standard of excellence and guest satisfaction ratings. In his prior roles, he has overseen the construction and launch of several luxury ships and facilitating innovative partnerships and onboard offerings with the likes of the prestigious Le Cordon bleu culinary school in Paris and with renowned chef Paul Bocuse. His other successes have included a partnership with Jean-Michel Cousteau’s Ocean Futures Society to offer the Ambassadors of the Environment program for young travelers. In his new position with Crystal, he will support the line’s ocean cruises, as well as Crystal Yacht Cruises, Crystal River Cruises and Crystal Exclusive Class™ ships. A native of France, Sauleau will be working closely with Crystal’s teams in its Los Angeles headquarters and Miami branch office.